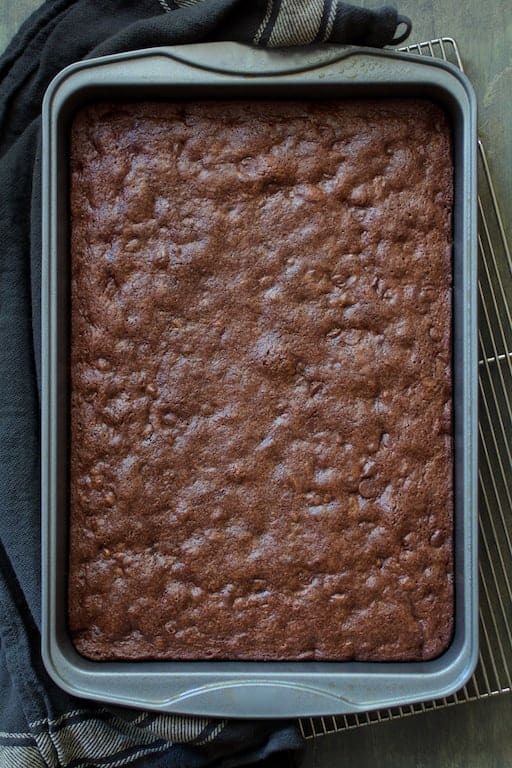 Whole Wheat Ancho Chili Brownies will add some spice to your life! Intensely chocolatey, they also pack a little heat with a touch of smokiness for a seriously delicious combination! Special thanks to Simply Organic Spices and Seasonings for sponsoring this post. All opinions expressed are my own. ….Hooked on adding a touch of ancho chili powder to brownies after giving it a try in this variation of a recipe I’ve been making for years! If you’re reading From A Chef’s Kitchen for the first time, you won’t find many dessert recipes here. It’s just my husband and me so a pan full of something decadent is not something we need to be indulging in. I’m not that enthralled with making desserts either. Some people are cooks, some are bakers. Some are fortunate enough to be both! My mother could do it all very well, but it appears I only got the cooking gene from her. So, whenever I post a dessert recipe, it’s easy and I feel it’s a winner. These Whole Grain Ancho Chili Brownies are that and are worth the dessert indulgence! I teamed up with Simply Organic to share these amazing brownies with you. Simply Organic just expanded their family of spices to include a wonderful ancho chili powder. Simply Organic offers 100% organic herbs and spices. 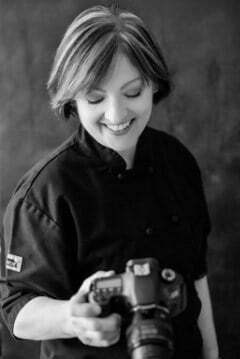 I’m very particular about the herbs and spices I use for my personal chef clients and I can always feel good about using Simply Organic. Whereas “chili powder” is generally a blend of dried and ground chiles, ancho chili powder is made only from dried Poblano peppers. Poblano peppers are used in authentic Mexican and Southwestern cooking and have a deep, rich, smoky flavor with mild to medium heat. 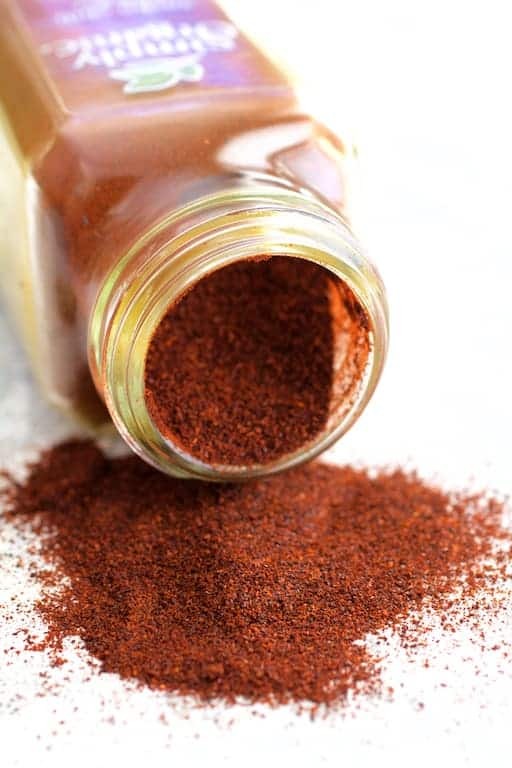 Because of those qualities, Simply Organic’s ancho chili powder is the perfect addition to brownies! These brownies are so easy, they practically mix up in one bowl! First, you’ll need to melt the butter and brown sugar together. This can be done in a double boiler or slowly and carefully over low heat in a saucepan. I don’t use any fancy equipment. I place the butter and brown sugar in a stainless steel bowl, set it over a pot that I filled to approximately 3/4 of the way with water, bring the water to a boil, then let it slowly melt until I can easily whisk it together. Stir in the rest of the ingredients and bake. These are so, so easy and are the perfect “adult” brownie! 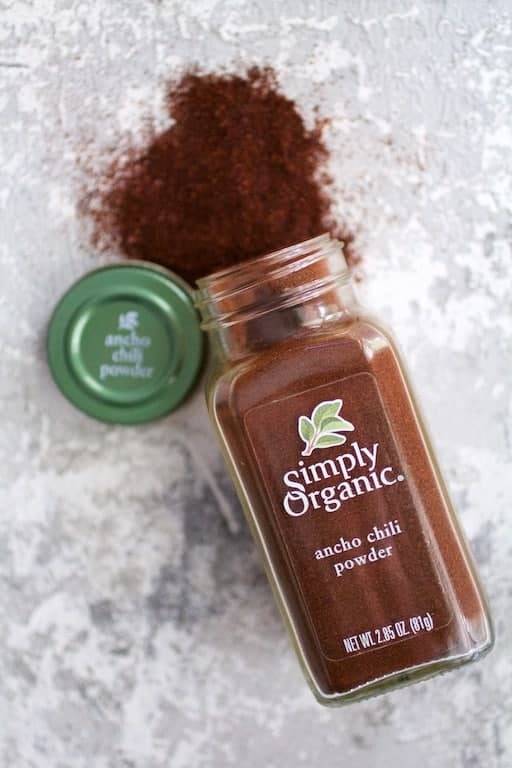 Simply Organic’s ancho chili powder is wonderful and will make a wonderful addition to your spice cabinet! 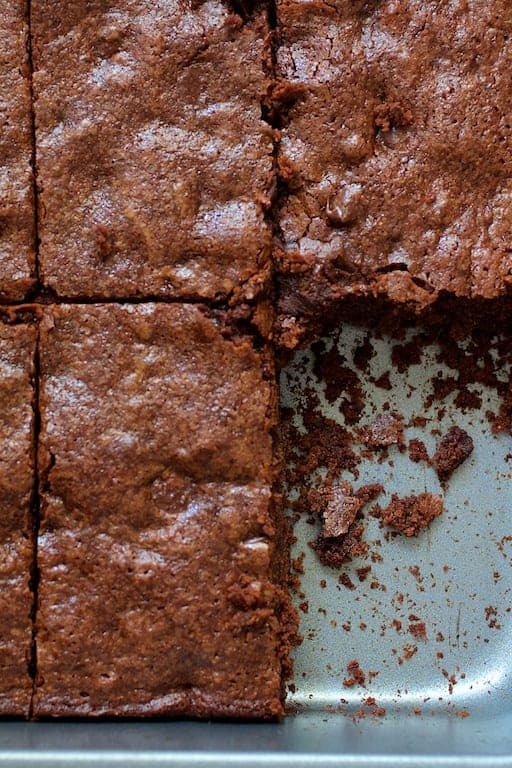 Now, go make these Whole Wheat Ancho Chili Brownies! Enjoy! 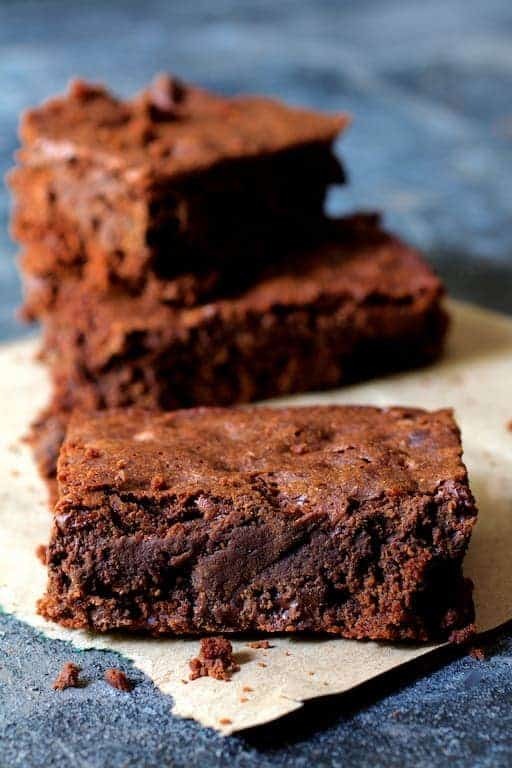 Intensely chocolatey Whole Wheat Ancho Chili Brownies also pack a little heat with a touch of smokiness for a seriously delicious combination! Preheat oven to 350 degrees. Spray a 13 x 9-inch cake pan (preferably nonstick) with cooking spray. Combine butter and light brown sugar in a large stainless steel bowl. Fill a large shallow pot approximately 3/4 of the way. Set the bowl over the pot and bring the water to a boil. When the butter begins to melt, whisk the sugar and butter together until hot and the sugar is dissolved. Remove it from the heat and immediately add the cocoa and ancho chili powder. Set aside to cool approximately 15 minutes. Meanwhile, combine whole wheat flour, salt and baking soda in a separate bowl. When the butter and sugar mixture has cooled, whisk in the eggs, vanilla extract and orange zest until combined. Add the flour mixture and chocolate chips and stir until combined. Pour into prepared pan. Bake 30 minutes. Do not over bake. The brownies should appear set around the edge and in the center. Cool to room temperature before cutting. Chili powder in brownies, though I’m not a fan of spice my husband is, I can’t wait to make these for him to take into work for him and his coworkers! Thanks! Thanks, Madelyn! Hope he and the guys enjoy! This should be called Brownies with a Twist! I’ve never heard of putting a spice like that in brownies. I would definitely like to try! Thanks, Dawn! It works great! I’ve seen a number of chili recipes that have you add a touch of chocolate at the end because the two flavors work so well together. Hope you enjoy! These sound amazing! Love the addition of ancho chili!! LOVE this idea! 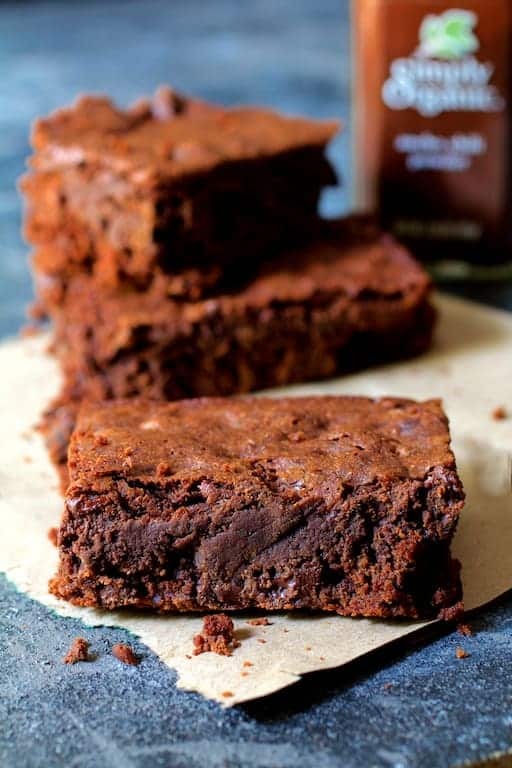 Ancho chilli can only make brownies better, right?! I am not a fan of brownies but I would definitely give these a try! So chocolatey and decadent they don’t sound overly sweet and that bit of spice spikes my interest. Yum! Chocolate and chili! Sweet and heat! Great combinations and I bet you can’t eat just one! I’m anxious to try these out. All of our grandsons love anything with heat will devour these in no time. Thanks, Marisa! It really is a great combination! I absolutely LOVE using chili powder with chocolate. These brownies sound delightful. Bonus that they are whole wheat. Having lived in Santa fe for a few years, I have a deep appreciation for chile added to sweets (they do it all the time there!). These brownies look absolutely delectable. Yum! I’ve never tried chili brownies, but now I am dying to have one! Thanks for the recipe!! Thanks, Dalya! Hope you enjoy!